Alright, finally a Daring Bakers Challenge that was a real challenge! This month we made tiramisu and made everything from scratch. About the only thing I didn't do was milk the cows for the cream. My favorite part was making the ladyfingers. As usual, roomie A. and I were so impressed when the final product turned out exactly as we expected it to and hoped it would. 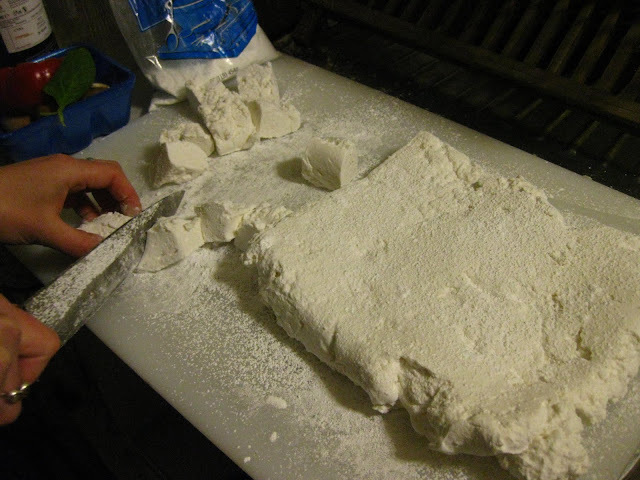 To make ladyfingers, you just make a simple dough out of whipped egg whites, sugar, egg yolks, vanilla and a small amount of flour. 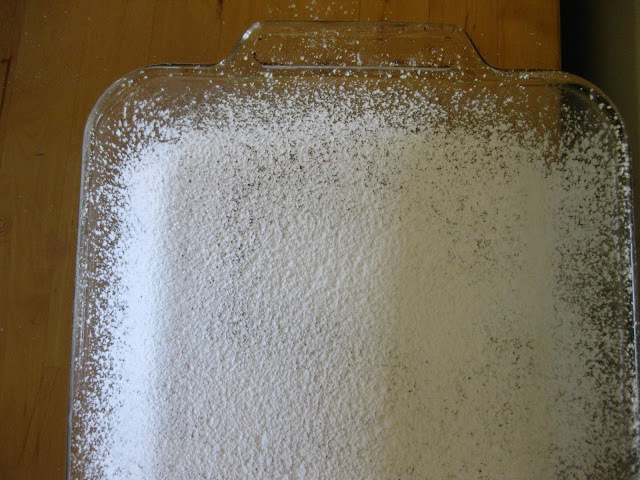 Then you pipe them onto oiled parchment paper, sprinkle them with powdered sugar and bake 15 minutes. 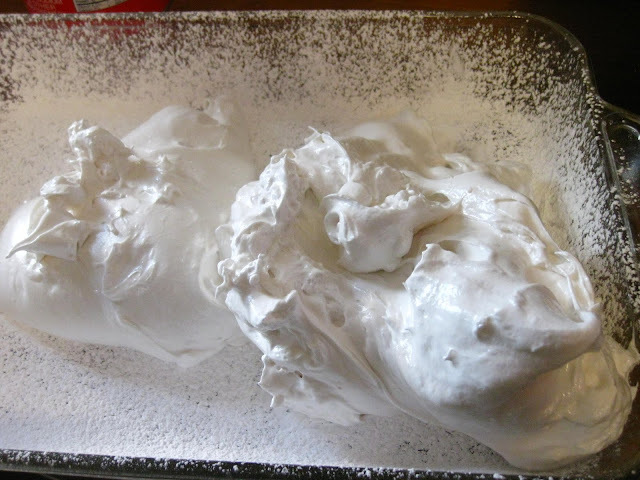 As long as you are gentle while folding the dough, they will puff up and be light and airy. We even had to make the mascarpone cheese. My cheese connoisseur friend informed "That is not mascarpone, that is creme fraiche!" in her snootiest cheese voice, but hey, I just do what the Daring Kitchen tells me to do. 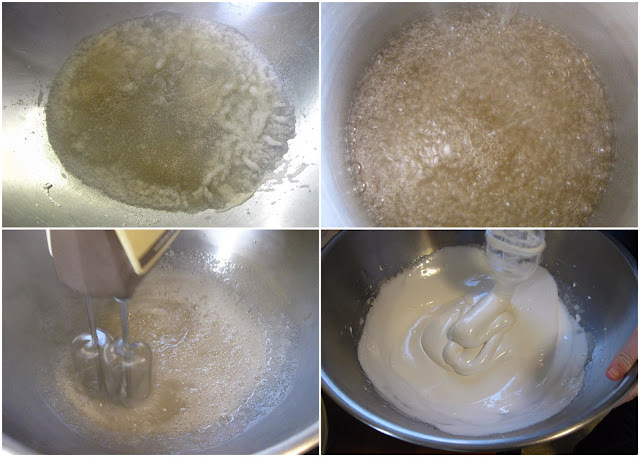 To make mascarpone, I heated heavy cream over a double boiler for 15 minutes, until it reached 290 degrees F. Then I stirred in 1 tablespoon of lemon juice and stirred for a few more minutes. Nothing really happened, but my recipes said that it would firm up after 24 hours in cheesecloth. Sure enough, the next morning, my cheese had taken on the consistency of cream cheese. 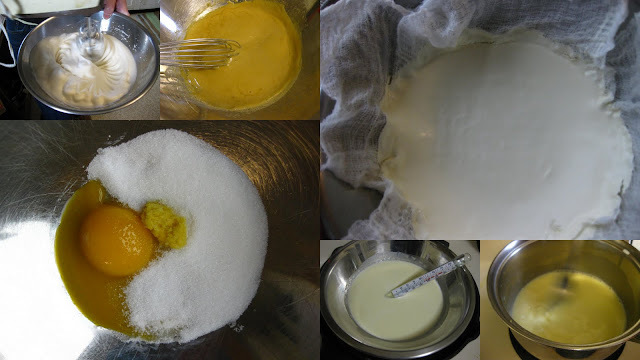 Roomie C. made the pastry cream, by heating milk, vanilla, sugar, a wee bit of flour, and an egg yolk over low heat. After figuring out that you have to have the right burner on to heat stuff (ha! ), eventually the pastry cream thickened and went into the fridge to cool. I made zabaligone, a thickened custard, out of egg yolks, coffee, sugar, and lemon zest. As I started to heat it and the smells came together, I said, "It smells like tiramisu!" After all our different creams, cheeses, and custards were chilled in the fridge, we folded them all together and were ready to assemble the tiramisu. The ladyfingers are dipped in a coffee sugar mixture and then layered with the cream- like a big Italian dessert lasagna! The end result was awesome! It wasn't very coffee-y but really lemony! Maybe I should have used espresso instead of coffee (even though I made it double strength coffee). But the ladyfingers didn't get too soggy and of course, the cream is soooooo good. Beware the delicious Italian dessert, you might eat the whole pan in one sitting! Sometimes when I'm browsing the Interwebs for recipe inspiration, I'm looking to find a recipe that uses a specific ingredient in a specific way. Obviously, I know what the ingredient is, but I only know in a "I'll know it when I see it," kinda way how I want to use it. And of course, I often don't find what I'm looking for. Anyway, I usually end up thinking, No... no... no... dammit, Epicurious, why don't you just give me what I want!? The ingredient I wanted to use this time was ricotta. As you can see, I ended up using polenta. But it wasn't that my frustration with the Internet's inability to read my mind led me to give up, but rather that this recipe (and this recipe) got me so! excited! makes for yummy time! Oh wait, there's even more! Two cracked eggs and lots of sliced mozzarella, and a quick pop back in the oven for a few minutes. And yum! This dish is really hearty, calls for some crusty bread on the side, and maybe a green salad to health it up a little. Now if only that tub of ricotta would stop staring at me! Heat oil in a large skillet over medium heat. Add the onion and cook until translucent, about 5 minutes. Add garlic and chili flakes and cook for one minute more. Add the sausage, stirring and breaking into small pieces as it cooks. Drain your sausage if it is particularly fatty. 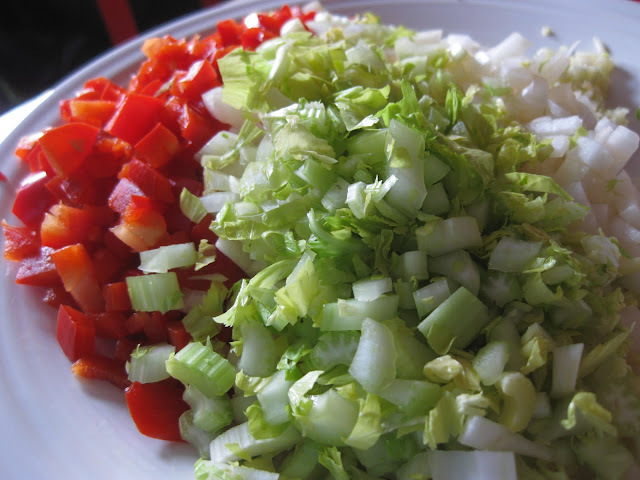 Add can of crushed tomatoes to skillet, with fresh herbs and season with salt and pepper to taste. Simmer about 10 minutes. 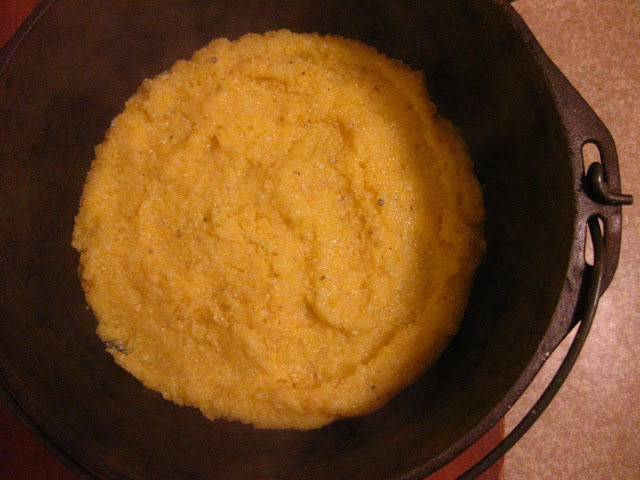 Meanwhile, cook polenta according to package instructions (2:1 water to grits). 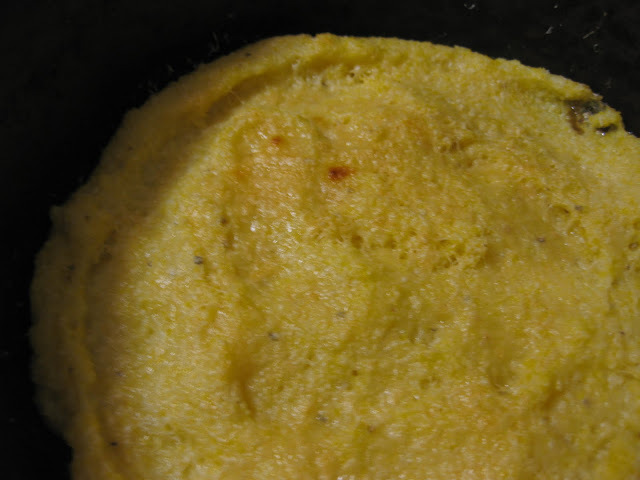 Spread polenta into the bottom of a greased cast iron dutch oven or a 9x9 pan. 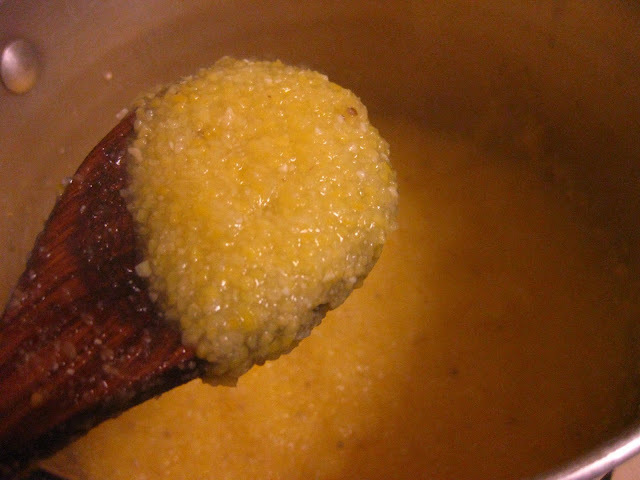 Sprinkle Parmesan cheese over top of polenta. 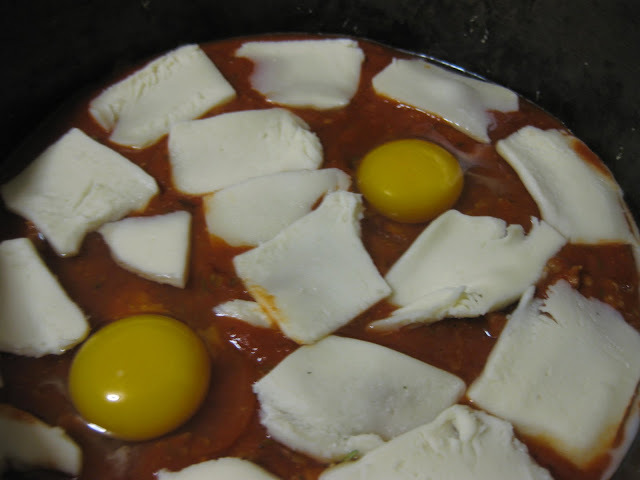 Place under the broiler and broil until cheese is melted and beginning to brown. 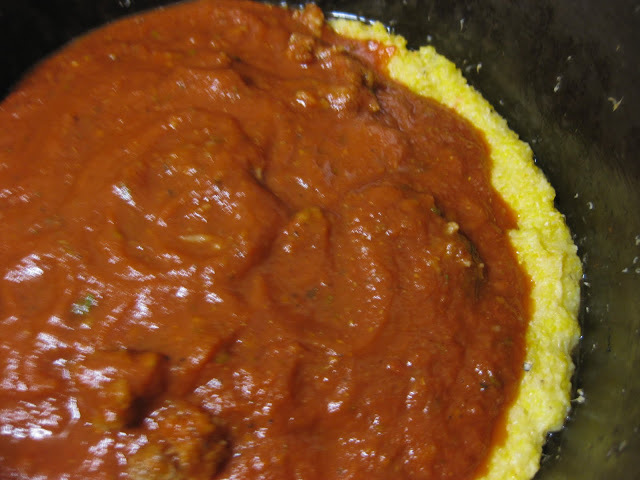 Turn oven down to 350 degrees F.
Remove pan from oven and pour tomato sauce over polenta. Make two wells in the sauce and crack an egg into each well. 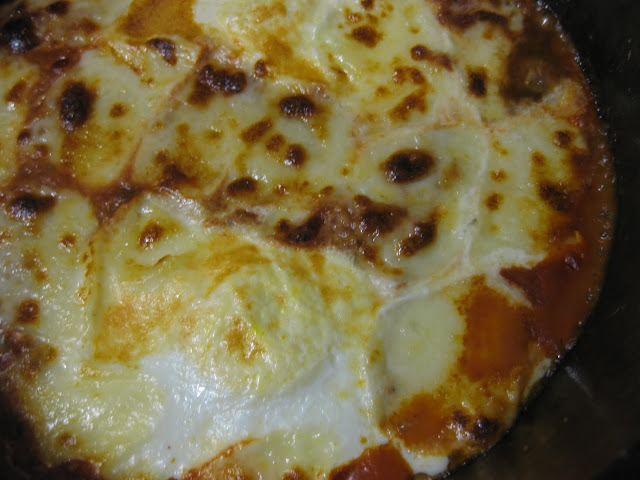 Cover eggs and sauce with slices of mozzarella cheese. Bake in the oven 15-20 minutes, depending on how well done you like your eggs. Let cool a few minutes before serving, and serve with more Parmesan cheese. 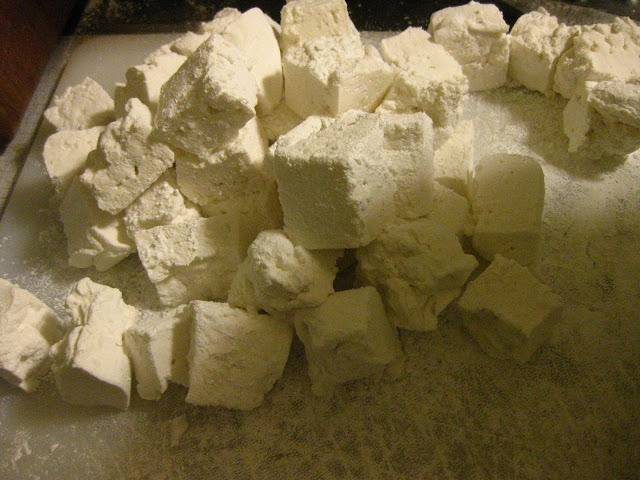 There was a lot of yelling in my kitchen the night my roommates and I decided to go all out and make homemade marshmallows and graham crackers. I guess it was a few seconds after I took the shot in the lower right corner that the yelling began. A. was really concerned that the marshmallow mixture was creeping up the beaters, like some sort of Creature from the Black Lagoon (or like a white, delicious lagoon). I didn't really see the urgency, but it turns out she was right, because when she went to use the hand mixer last night, it just made a pathetic little whizzing noise. Sorry, mixer. With the marshmallow mixture sufficiently taking on a life of it's own, we decided it probably didn't need any more encouragement. We wrestled it into the pan (again more yelling), attempted to shape it into something pleasing to the eye, and put it in the fridge. 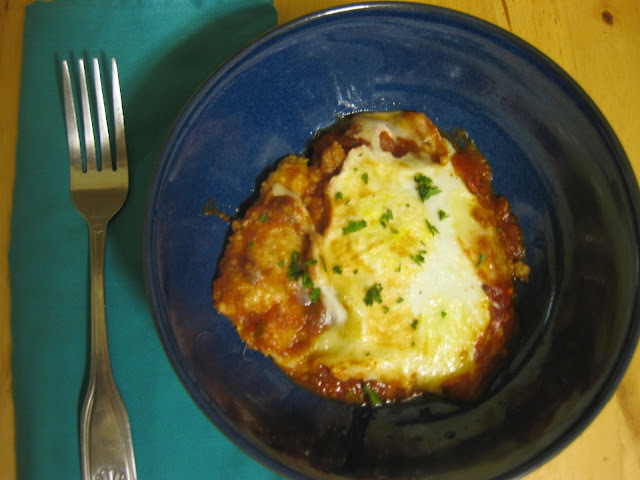 If you head on over to check out Smitten Kitchen's experience with this recipe, you'll see her's looks a lot different than our's at this point. When it came out of the fridge, there was more yelling, but this time it was exciting yelling. Again with the, we're-really-excited-because-it-looks-like-what-it's-supposed-to-look-like. Right about now, I'm thinking, what the H am I going to do with all these marshmallows? While that may not be a problem in your house, I am really good at making a lot of dessert and then losing interest in it and not eating it all. 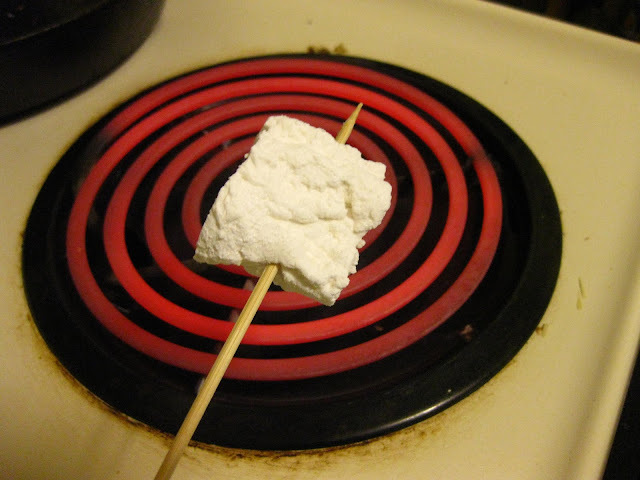 These marshmallows were so awesome, they tasted SO much better than regular marshmallows. They were sweeter and had a much better texture... which led to more yelling. For some reason these mallows went from solid to gooey, hot napalm in like .02 seconds. You're like, grilling, grilling, grilling, OH GOD, why is it sliding off my skewer!? 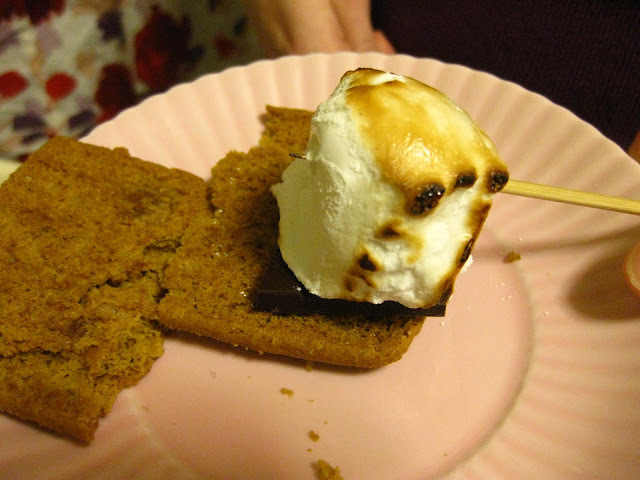 Quick, quick, get me a S'more set up! And it's really hard for people to take you seriously when you have marshmallow goo all over your face and don't know it. I don't understand what went wrong. How could it? Tempura fried bacon? Pork belly Reuben? Bacon dusted fries? But on Saturday night, the kitchen found a way to crush my high expectations, generated by all the favorable reviews flying around about the newly opened Nosh Kitchen Bar. I don't want to pan the place, it's got a lot going for it. And all the raves give me hope that this was just an off night. That they're struggling with consistency due to being a new (and very popular) restaurant. I appreciate that the kitchen and bar are staffed with some seasoned industry pros and that everyone is entitled an off night, particularly within the first month of opening. But man, I was disappointed. Our shining star was the charcuterie plate that Uke Mochi of Edible Obsessions ordered for us. Clockwise around the plate, starting in the upper left, we had Jamon Iberico ($6), Petit Jesus ($6), Foie Gras ($12), and Tuna Carpaccio (Market). Everything on the plate was great, from the silky tuna to the rich sweet Foie. And who doesn't love salty, cured meats? While we weren't real impressed with the tempura bacon- both the batter and the bacon could have been crispier- the real hiccup of the evening was the Pig Belly Reuben ($10.50). 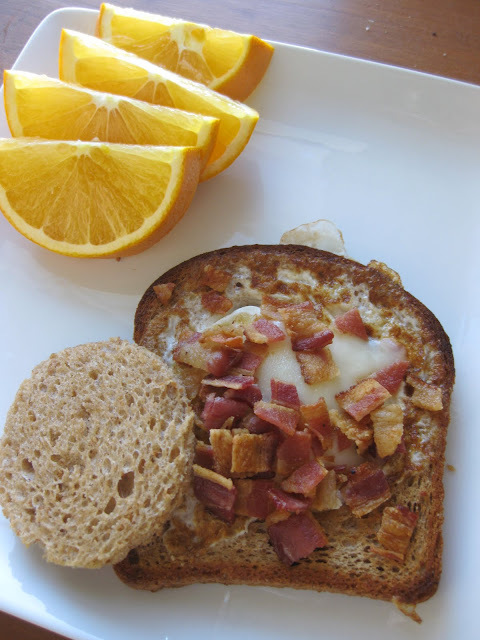 This sandwich is pork belly, caramelized onions, cheddar cheese, and Russian dressing on toasted light rye bread. And really, everyone I've talked to who has eaten here, says this sandwich is heaven on a plate. Sheer greasy, fried, fatty decadence. But the two sandwiches we ordered to share between the four of us were not that at all. The pork belly had been overcooked, robbing it of its juicy fat and rendering the meat dry and blackened. And at these price points, I would hope that you would get more than 2 or 3 slices of pork on each half of your sandwich. Dawn, of Appetite Portland, and the author of one of the afore mentioned rave reviews, vouched that the sandwiches we received were nothing like the one she'd eaten the week before. 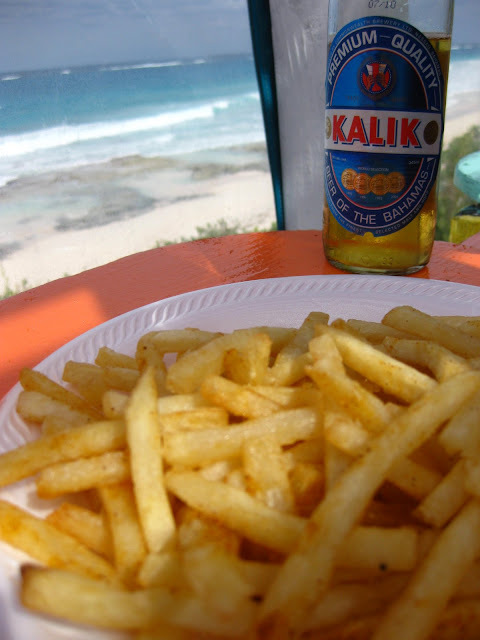 And mind you, the sandwiches only come with a pickle, if you'd like try some of their house cut fries, you'll have to cough up an extra $5 for a little tin. While I really love the transformation of the space from the old, kinda cold and dark White Heart to a cozy, warm, well-lit space that meshes kitchen, bar, and restaurant well, I don't see myself frequenting the place until I hear that my next $10 won't yield me disappointing results again. 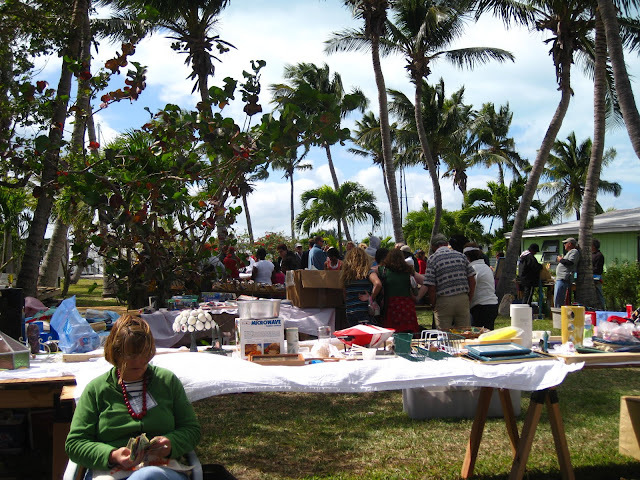 When I woke up in Marsh Harbour last Saturday, M. informed me we had to "hurry" over to Man-O-War Cay to attend their annual flea market. I informed him right back that I was on vacation, and there would be no hurrying or getting up early. But we made the 10:30 ferry over to Man-O-War with a lot of other Abaco Island residents also going to check out the event. 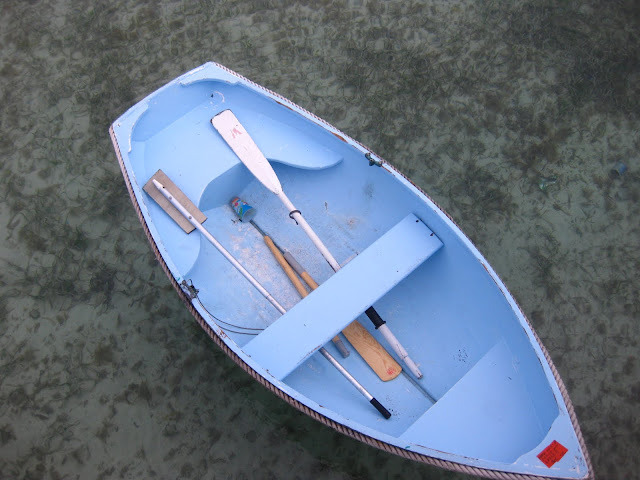 M. and his dad were in search of an oar for their dinghy, as they lost one while crossing the Gulf Stream on their way to the Bahamas from Florida. I figure it's on its way to become part of that giant trash mat floating in the Pacific. So due to all the rum punch and the complete lack of dinner the night before, I was a little, how do you say, hungover. The ferry ride was a little dicey- it was super rough and I distracted myself by taking to two of the nicest older ladies ever. But I made it in once piece, and M. decided we needed burgers to set ourselves right. They were selling all kinds of food at this fair, from plates of Bahamian souse chicken and Johnny cake to hotdog and hamburgers. We waited in the rather cutthroat cheeseburger line (no cutting! 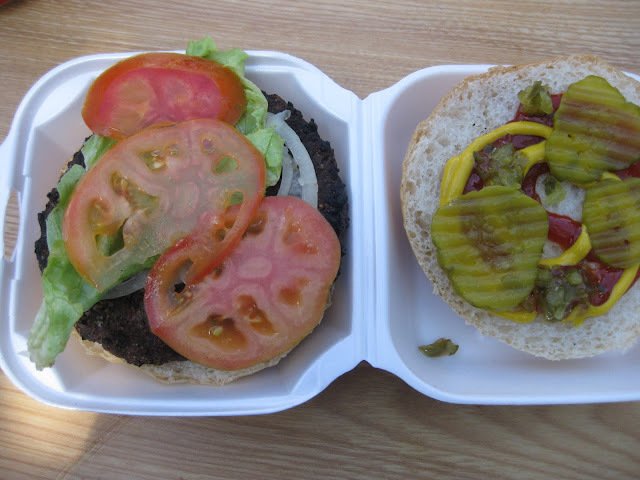 ), and procured ourselves two fresh-off-the-grill patties for $12 total. We fixed 'em up and sat down on the curb to people watch and chow. Only, I couldn't really eat mine. I was super afraid of tossing down (and then back up) a big ole rich beef patty. But after some stern talking to from M., I ate my food and actually felt right as rain for the rest of the day. They never did find their oar, but we had a great time soaking in all the local culture. 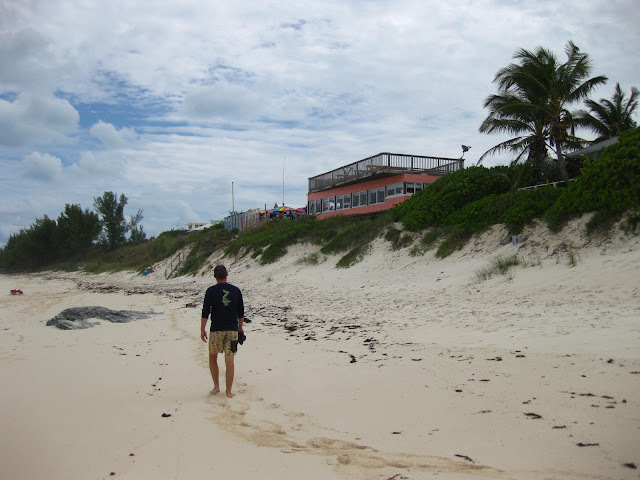 Man-O-War Cay was settled by British Loyalists from South Carolina at the time of the American Revolution. The island is a dry island, very conservative, and everyone has the same last name of Albury. 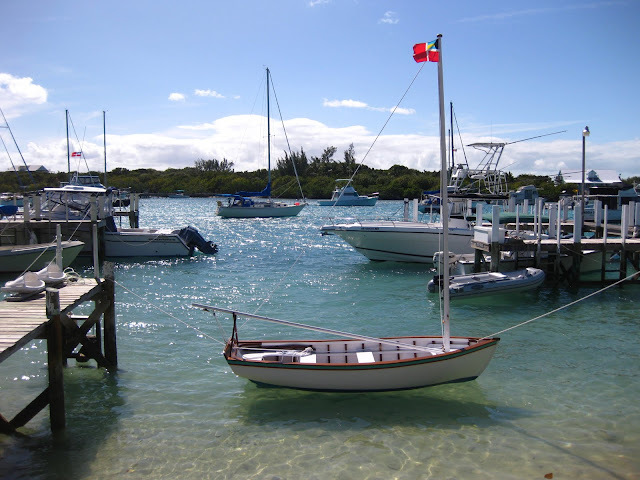 Their main industry (aside from tourism) is boatbuilding, both traditional wooden Bahamian fishing boats and newer design fiberglass boats. 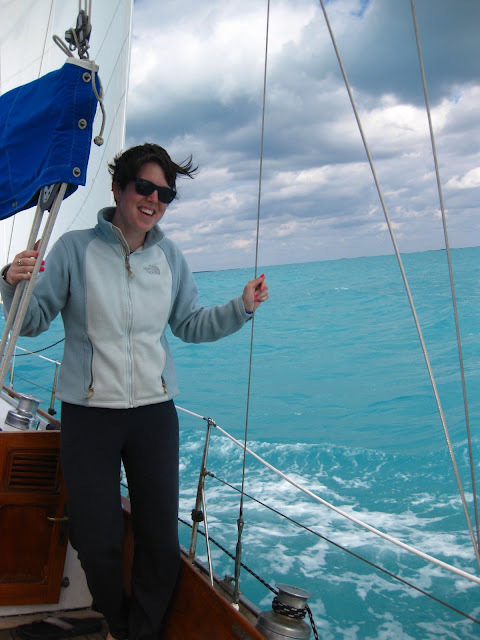 It's an idyllic little island, but after a few days, we set off sailing in search of some more rum! Ed. note: Sala Thai has closed. Welcome to the first installation of the Portland Tastes of Thai Project, in which 9 food bloggers and writers will eat at and review all 14 Thai restaurants in Portland! Stay tuned for a new review every 2 weeks and see Portland Food Map for the links to the other writer's reviews. 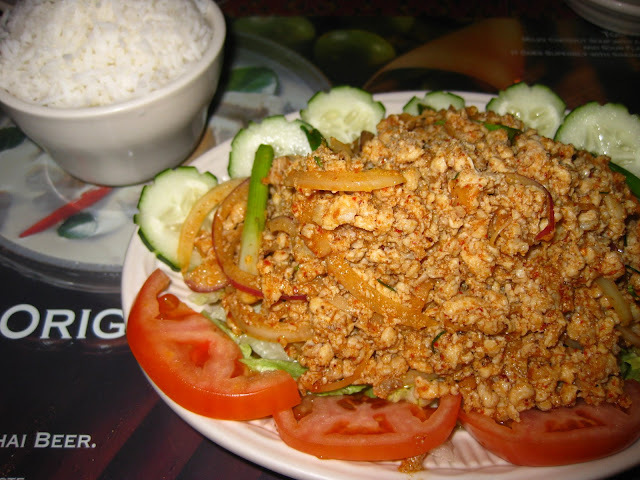 Our first stop was Sala Thai out on Washington Ave. at Allen Ave. I stopped by for dinner with my friend A. We were seated at a table for two in the front of the restaurant, which obviously used to be a fast-food restaurant (Wendy's is my guess). That said, they did a pretty good job of disguising that fact, with a lot of busy Thai-themed decorations (screens, gold whoosits, digglies hanging from the ceiling, busily patterned curtains, etc.). Very kitschy, but cute. After we settled in, A. and I both ordered Singha, a Thai beer. 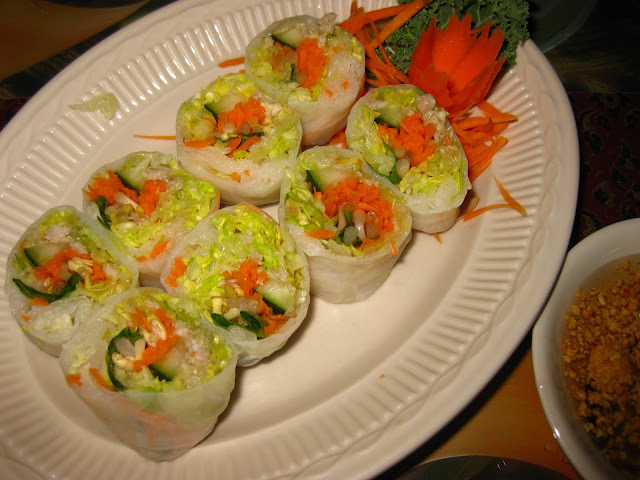 To start, I had the Fresh Spring Rolls ($4.99) available in pork or veggie. I asked for pork, but either the pork was indiscernible or I got the veggies ones. No matter, the rolls were great, with a nice basil kick and a great sweet and sour (with lots of crazy peanut dust) dipping sauce. 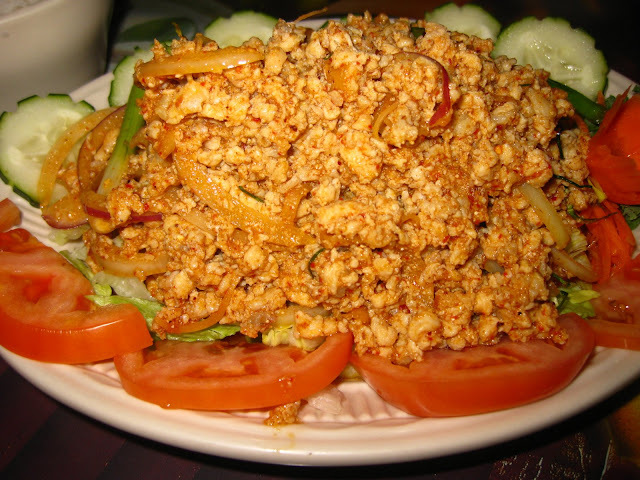 And while I wasn't disappointed, this Laab Gai didn't quite live up to my (admittedly high) expectations. It could have used more veggies underneath, and while I got a great lemongrass zing every other bite, I wasn't blown away by the seasonings. At least it wasn't dry! A. got the Masaman curry ($10.99 for tofu), and I was a kind of surprised by how little she got for the price. It was a tiny dish, and there's no price difference for the vegetarian and meat options- except the $12.99 duck. But the peanut-y curry was sweet and flavorful and there was lots of veggies with her tofu. Whether you like it or not, Valentine's Day is fast approaching. Maybe you're single, maybe you're coupled, but either way, this can be an anxiety-generating holiday. And then in middle school they had that carnations gig, where you could buy a flower and have it delivered to someone? Talk about nerve-wracking! Of course, I had a great group of girlfriends, so I always got enough 'friend' flowers and maybe it looked to others like there might be one from a boy mixed in there (and sometimes there was, OK!?!). So now as adults, there's a lot of grumbling about the commercialization of V-Day, as well as the 'I'm single' gripes, and the 'he should WANT to get me a nice gift, I shouldn't have to TELL him to' rants. In the end, it makes a fine case for staying in bed on Sunday, with or without someone else. And if you want to hop up first, and make yourself a simple breakfast treat, I recommend Egg in a Nest. You know, where you cut a hole in the middle of a slice of bread and fry an egg in it? Oh yeah. And Pinch My Salt put a holiday twist on it by using a heart-shaped cutter on her bread (which can be either really sweet or creepily vindictive). Me? I'm off to the beach to visit my man, so that's it for me until Tuesday. I hope y'all have a nice weekend, and try not to let the holiday stress you out, ok? It's supposed to be fun. 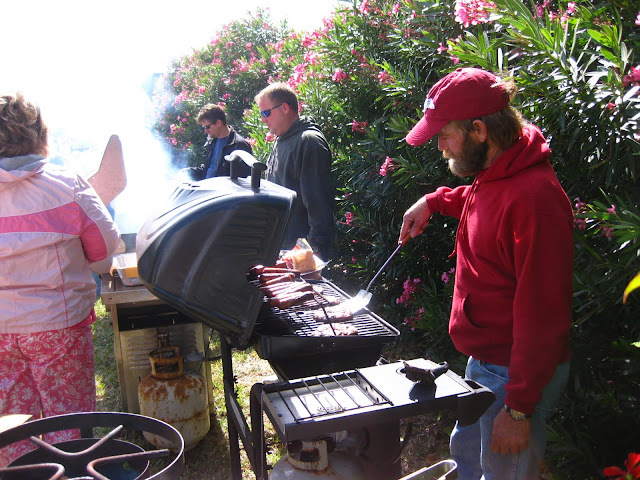 Whew, that was one fun Super Bowl party and a well deserved one after a marathon cooking session yesterday afternoon. And while I am not a Saints fan during the regular season, I certainly was rooting for them last night. But most of all, I was excited for the excuse to add some Cajun dishes to my cooking repertoire. So to cheer the Saints to victory, I decided to make Gumbo and a King Cake. So the gumbo turned out the best of the two recipes. 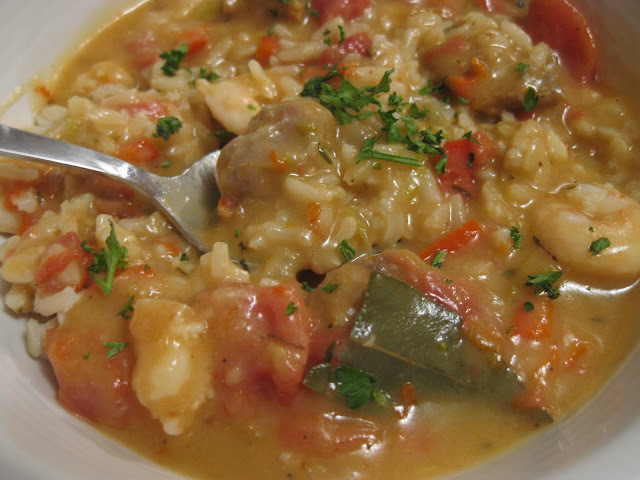 I adapted Bittman's Scallop Gumbo recipe from the New York Times to include local shrimp and spicy sausage. I had another frustrating Bittman experience because the roux (2 T. butter, 1/4 c. oil and 1/3 c. flour) never thickened. I cooked that sucker for a good 15 minutes before I started adding flour by the tablespoon. 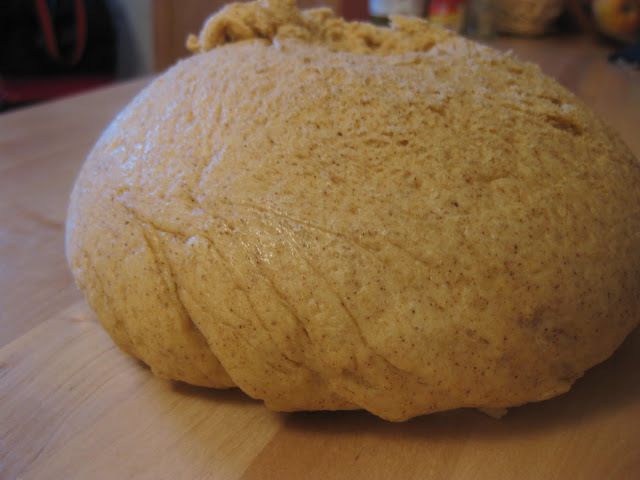 While it did achieve a nice peanut butter color, it never thickened up too much. But I went ahead with the recipe anyway, and then was frustrated again when I found the final gumbo to be TOO thick. Sigh. But I got it all sorted out in the end and much to my delight, everyone loved it! Thanks everyone for raving about the gumbo and making me forget all my Bittman-induced anger. Now for the dessert, I turned to John Besh whose Mardi Gras menu is featured on Epicurious right now. The man must know his stuff, being a James Beard winning NOLA chef, right? 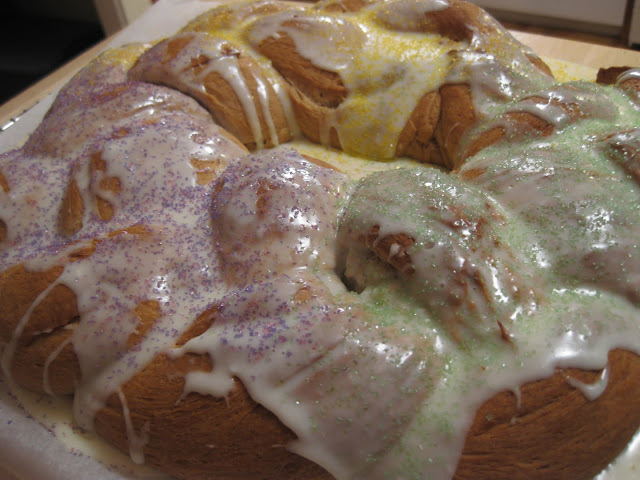 But I found this King Cake recipe to be a little disappointing. But before I throw Besh under the bus, I must admit that there is always room for user error. The dough was off to a promising start- it was smooth and elastic, smelled wonderful and had 5 egg yolks in it. Good, right? 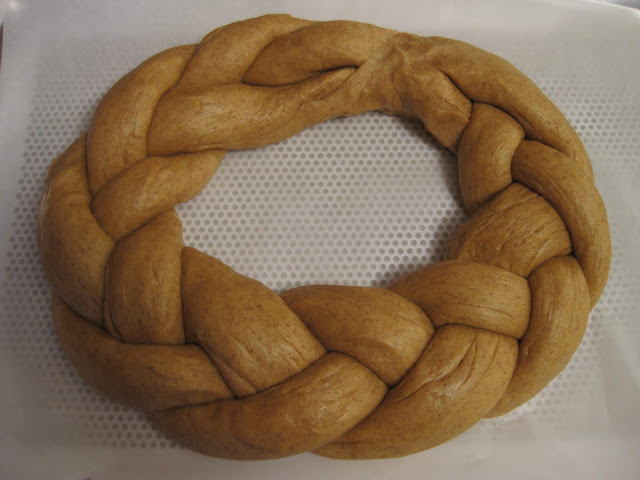 Thanks to A. for the use of her kitchen and for this beautiful braiding job! 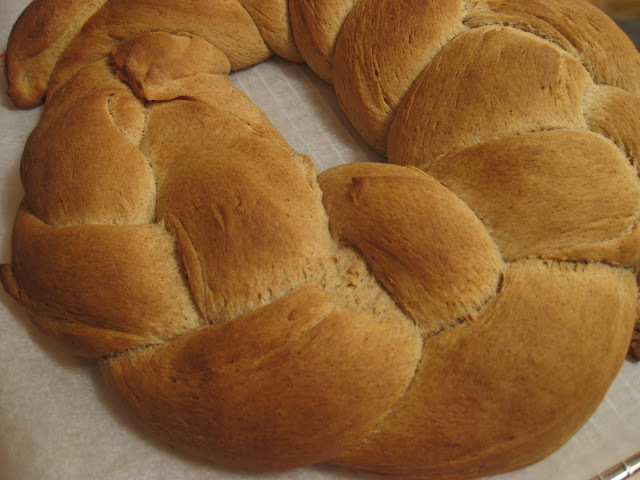 I've read that you can make a cheater's King Cake by just braiding together canned cinnamon roll dough. And while I certainly would have felt like a cheat, I think that would have been better than this version. It was a little... dry. Dare I say overcooked? I dunno. 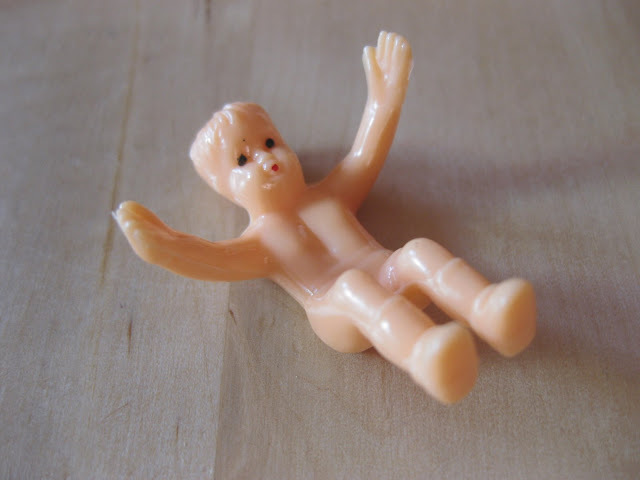 But whatever, I got to creep people out with this plastic baby, so it was all worth it. And I got to go buck wild with my purple, yellow, and green decorative sugars. Wahoo. Really, those were the things I was looking forward to the most while making this cake. So that it wasn't all that great was kind of incidental. But I really wanted it to be dynamite! Enjoy your Mardi Gras celebration, I'm looking forward to the excuse to eat some shrimp, gravy, and grits!